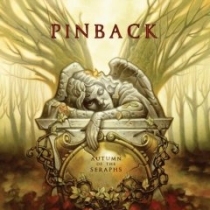 The prolific Rob Crow and his band Pinback have a new record set to drop on September 11, 2007 entitled Autumn of the Seraphs (Touch and Go). Pinback are also embarking on an ambitious 35 date tour in support of the new release which will see them in NYC at the Nokia Theatre (of all places) on October 9th. I’ve just had myself a little listen to Autumn… and I can personally give it the ‘Shine seal of approval. I really and truly hope the tourists (and the locals) come out in full force for the Pinback show at the Nokia, I gotta admit the venue choice baffles me a little. All Pinback tour dates below.